Why do group net metering policies include so many unnecessary exclusions and caveats? But only a few states allow a lesser-known policy that is critical for the expansion of distributed renewables, particularly community-scale solar -- also known as aggregate, virtual, or group net metering. And there are a lot of good reasons to want to see its expansion. Whatever you want to call the policy, looking at the small number of states that permit such net metering reveals a myriad of unnecessary exclusions and caveats which limit their effectiveness -- and the amount of net metered solar that exists. For example, New Jersey’s policy adopted this month is restricted only to public projects. Pennsylvania’s version is called “aggregate virtual net metering” and is limited to individual customers who own multiple meters within a two-mile radius. California allows for sharing of credits for multi-tenant properties and also for local governments, but only if all participating accounts receive a time-of-use rate. It’s an important enough issue that the net metering report Freeing the Grid recognizes aggregate and group net metering policies as key ranking indicators when evaluating states. 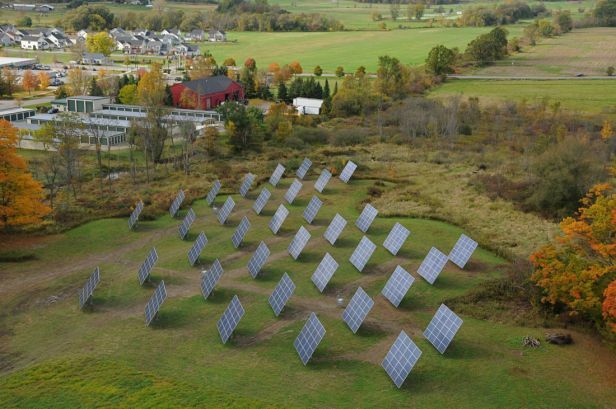 It’s Vermont that has the most advanced and solar-conducive policy. 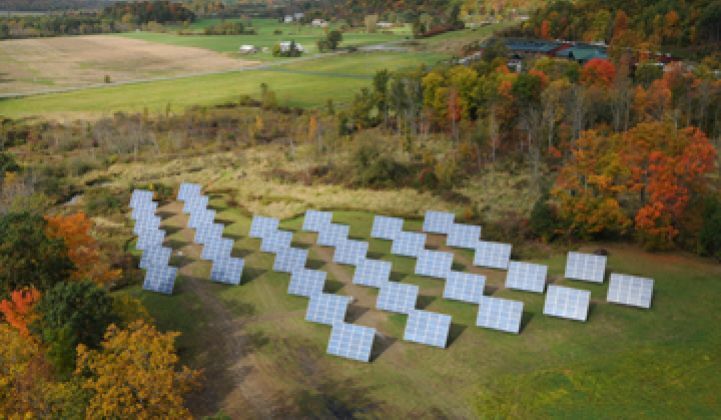 Started first with the concept of allowing multiple farm buildings to join a “group” for on-site generation, Vermont’s expanded “group net metering” law allows offsite generation up to 500 kilowatt (2.2 megawatts for military). The only requirement is that members be in the same electric utility. That’s it. Groups may be mixed among residential, commercial, and government customers. Local utilities must reward credits and bill net metering customers within a group directly. And, notably, Vermont’s law recently provided time-of-use customers a consistent method for crediting their net metered production. The system has proven efficient, easy, and most importantly encourages net metering. Choosing the most productive sites: Group net metering allows installers, investors, and customers to choose the best possible site for a renewable energy system. 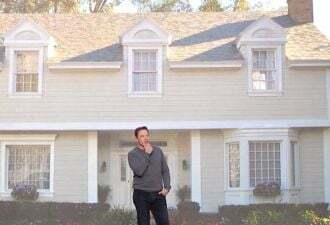 Rather than being boxed into a less-than-adequate roof or a geographic space too small or too shaded for the most cost-effective net metered projects, group net metering allows for ideal siting, making for a better investment with higher financial returns. Group net metering allows for greater flexibility when considering local planning, zoning, or historical requirements. Take for example two homeowners with roofs that are inadequate for solar. Under Vermont’s group net metering law, those two homeowners could easily join with a third neighbor or business and share the energy from a solar system installed at a more productive, economical site. Achieving economies of scale: While traditional net metered solar often makes a lot of financial sense, group net metering laws allow for economies of scale in larger project development. According to the Department of Energy, the average residential cost of solar is approximately $6.00 per watt nationally. [GTM Research's U.S. Solar Market Insight has the U.S. average system price as $4.44 per watt in the first quarter of 2011 -- ed.]. Meanwhile, larger scale distributed solar projects cost $3 per watt (for fixed solar) or even below. Consider also that land values vary dramatically even within the same electric utilities' coverage area, and you see how installing a site a little way down the road can also have a significant impact on financials of a project. Creative solar finance: Group net metering policies facilitate community solar projects and third-party ownership models, expanding opportunities for customers. As Sunrun, Sungevity and other third-party ownership models have demonstrated, innovative solar financing has proven widely successful in deploying residential net metered solar. This innovation continues with companies like Solar Mosaic which are creating mechanisms for “crowdfunding” projects, where individuals can directly make renewable energy investments. Promising new initiatives are enhanced by conducive local policies. Reduced default risk: For states that allow third-party or Power Purchase Agreement (PPA) investors to offer group net metering, these policies reduce the risk to an investor because should a net metering customer suddenly not have an electric load (a school closes, for example) or not be able to pay (in the case of a bankruptcy), the PPA agreement could be fashioned so that the energy output from the project could simply be transferred to a new customer within the utility if allowed under group net metering law. More solar for more customers: Group net metering policies help enable non-homeowners to invest in solar and have also facilitated the proliferation of solar programs for affordable housing tenants. For example, California’s Multifamily Affordable Solar Housing (MASH) Program was designed in 2008 specifically for low-income affordable housing, and the California Public Utility Commission reported earlier this month that virtual net metering has allowed thousands of low-income tenants to receive the direct benefits of solar as reductions in their monthly electric bills. In sum, aggregate, virtual, and group net metering polices allow for the expansion of more economical projects to provide renewable energy to an increasingly diverse customer base. The key is to get the policies right. State policies and individual utilities should look hard at how to dissolve the traditional, unnecessary boundaries in this industry. Such a policy shift could quickly usher in a brighter distributed renewable energy future.